09 Apr If You Can’t Calm Your Mind, How Can Your Child? Thinking your children need calm minds to meditate is kind of like saying you need to lose weight before start the healthy eating regime. 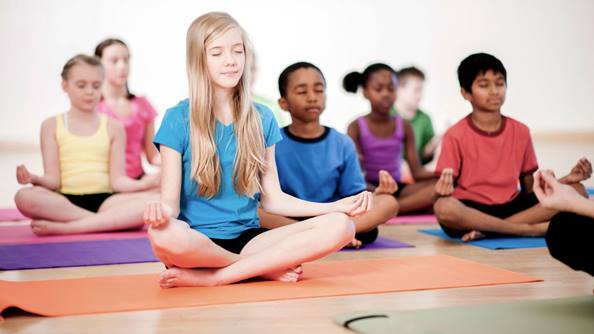 The great thing is, when children begin a meditation practice, they can feel the changes in their bodies and may be naturally drawn to continue the practice. Finding a practice that is easy for you and your children to participate in on a daily basis simply takes a little bit of exploration. If you want to try this at home, here are a few quick tips to keep in mind.Children are usually able to sit for as many minutes as their age (e.g., nine minutes for a nine-year-old or seven minutes for a seven-year-old). Children younger than five years can practice mindful activities or simple breath activities (see list below). Square Breathing: Teach your children this simple breath pattern. Inhale as you count to four, hold as you count to four, exhale as you count to four, and hold as you count to four. Guide your children to use this practice when they feel any powerful or overwhelming feelings. It can calm them, reduce fight or flight, and teach them that they can control their bodies’ reactions. Mindful Coloring: Focusing on a single activity like coloring lets the mind practice being present. Do it with your children for an added bonus of connection. There are no shortage of coloring books available—or use your creativity and make a bubble-letter drawing of their names, their top character traits or a goal they have. Nature Walk: Spending time outside is great for your children’s health. Encourage them to focus on what you are seeing or hearing as you walk. Try a silent walk or one where you take turns leading. Dance It Out: A five-minute kitchen dance party—while preparing dinner or before homework—is fun for the whole family. Take turns choosing the song and focusing on fun. Despite popular belief, mindful moments don’t just happen when you sit in a lotus position; they can happen when you are in any joyful flow activity. Gratitude Practice: Taking time with your children to acknowledge all the good things they have in their lives is powerful. At dinner, ask everyone to share the best moment of the day and one thing they are grateful for. Pay-It-Forward Practice: Model the law of giving and receiving for your children. Simple pay-it-forward practices like coffee karma (where you not only buy your coffee, but also pay for the one behind you) or random acts of kindness (when you do something kind for someone without being asked) allow your children to see that kindness matters and that by giving to someone else you receive a warm feeling that lasts and spreads.